in memory of Xerox employees who were killed a year ago. A bright shining legacy in each and every one. You'll live forever here in our hearts." -- Excerpt from "Here In Our Hearts,"
TWO HUNDRED mourners filled First Presbyterian Church in Makiki today in memory of seven Xerox employees gunned down exactly one year ago by a co-worker. A steady rain fell outside, underscoring the somber mood. Family, friends and colleagues of Jason Balatico, 33, Ford Kanehira, 41, Ron Kataoka, 50, Ron Kawamae, 54, Melvin Lee, 58, Peter Mark, 46, and John Sakamoto, 36, attended the memorial service planned by Xerox Hawaii employees. 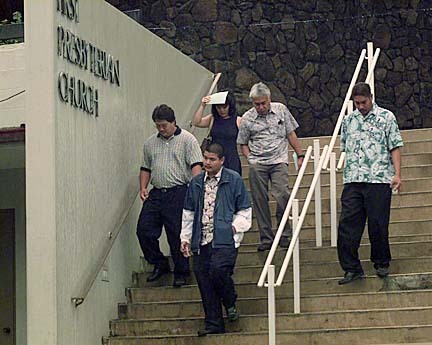 The seven men were shot and killed by Byran Uyesugi while beginning work at Xerox Corp.'s Nimitz Highway offices on the morning of Nov. 2, 1999. The tragedy, the worst mass murder in Hawaii's history, left seven women without a husband, several children without a father and a community wondering how and why it happened. "There will always be a hole in our hearts with jagged edges because of what has happened," the Rev. Dan Chun said following the private service. "But over time, with the love of the community and the love of God, those jagged edges will become more smooth. But the hole will always be there." The church was where dozens of children from two schools took refuge, after they were evacuated from the Hawaii Nature Center a year ago. It was near the nature center that Uyesugi was found, sitting in a company van he had driven to escape the murder scene. "The reality is that there is evil, but to balance that there is also hope, love and faith," Chun said. "And, as we shared in the memorial service today, love will never end. Love never fails. Because of the love of the community and the love of God, many people who are hurting today will find hope, strength and encouragement." Among those in attendance were Honolulu Police Chief Lee Donohue and city Prosecuting Attorney Peter Carlisle, who prosecuted Uyesugi for the murders. Uyesugi was sentenced to life in prison without the possibility of parole. Also attending the service were four victims' families and some of the employees hired to fill the positions left vacant because of the seven deaths. Mourners were given a compact disc with a song written in memory of the seven men. The song, "Here In Our Hearts," written and sung by church member and singer Roslyn Catracchia, brought tears to those in attendance. "We will never forget you," Glenn Sexton, Xerox Hawaii's vice president and general manager, said of the victims during the service. "We will miss the smiles that you brought to our faces. But the memories of your smiles inspire us to have hope that goodness will always prevail." He said the service was another step in the healing process for friends and families. "I'm very impressed with all their courage," he said of the families. "Each family has displayed tremendous courage in the face of a tragedy that would test anyone's strength. Xerox employees nationwide observed a moment of silence today at 8 a.m. in memory of the men. "We'll be whole again, we'll never forget, but we'll be whole again," Sexton said.